In a medium skillet, preheat 3 tablespoons of olive oil to medium heat for 3 minutes. Add the rice and cook for 5 minutes, stirring often so rice does not burn. While the rice is toasting, prepare your vegetables. Add the onions, carrots, poblano and whole serrano peppers. Sautee for another 5 minutes. Add the garlic and cook for another minute. In the meantime, add the tomatoes, celery, 1 3/4 cups of water and chicken bouillon granules to the blender. Blend on high speed until smooth. Add the tomato mixture to the pan of rice, stir well to combine. Add the smoked paprika, cumin, pepper and salt, and stir well. Reduce heat to a low simmer, cover and cook for 5 minutes. Taste for salt, and continue cooking until all of the liquid has evaporated. Cooking time will be about 14 to 17 minutes. Remove from heat and let stand for 10 minutes. 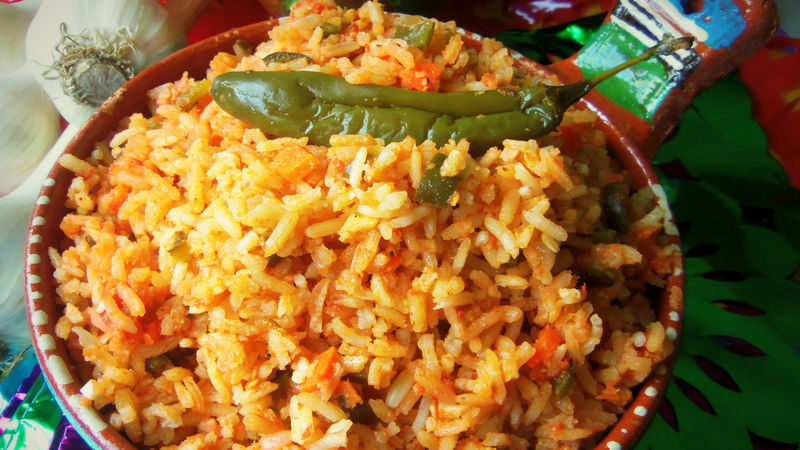 When ready to serve, fluff the rice with a fork and mix in the vegetables that are on the top layer of the rice. Serve warm. For the best results when preparing rice dishes, don’t disturb the rice after adding the broth to your recipes. Stirring the rice too much while it’s cooking will cause the rice to break down and become mushy. Cook it at a low and even temperature for fluffy rice. Out of all my mom’s delicious recipes, red rice was always my favorite. She prepared it at least twice a week in our house. Red rice was a dish prepared in our house at least twice a week. It’s a simple recipe that has been passed down for generations. That distinctive aroma of the toasting rice brings back memories of my mom standing in her kitchen with music in Spanish playing in the background. That was a sure sign that the meal was going to be delicious!